If you’re a fan of or are interested in electric/hybrid vehicles you should make plans to drop by ScienceWorks next month. 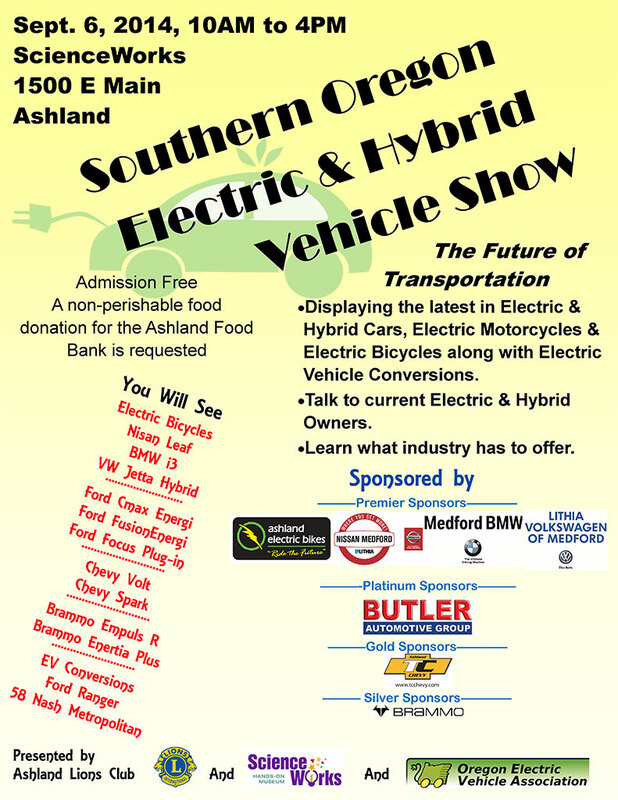 On September 6, 2014 from 10:00 to 4:00 the hands-on museum will be teaming up with the Ashland Lion’s Club to present the Southern Oregon Electric & Hybrid Vehicle Show. Learn about the future of transportation, talk to current owners, and see what kinds of inventions are coming down the pike. Several local dealers, including Butler Ford, will be represented. We’ll be offering a Ford C-MAX Energi, Ford Fusion Energi, and a Ford Focus Plug-In. You’ll also get to see electric motorcycles, electric bikes, and electric vehicle conversions. You could even win an electric bike of your very own! It’ll be fun and educational! See you there!